Valdes’ Jazz Batá was considered a departure into the avant garde when he made it in 1972. That trio recording was a preview of advances to come from the great Cuban pianist and composer. 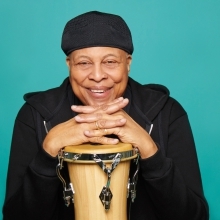 Nearly half a century later, the followup finds him as adventurous as ever, heading a quartet that concentrates on mastery of the batá tradition of West Africa, long a major component of Cuban music. 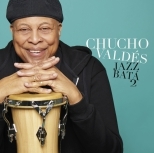 In their rhythmic power and harmonic acuity, Valdes’ piano solos throughout are riveting, none moreso than his work on “Ochún,” a Haitian merengue that recalls Chucho’s father Bebo because of the elder Valdéz’s close association with Haiti. Violinist Regina Carter’s empathy with “Ochún’s” blues-drenched harmonies takes shape in the first of her two striking guest appearances on the album. She is sensuous, flowing and forceful in “100 Años de Bebo,” described as “a danzón-mambo” that Chucho heard his father play when he was a child. This new album, packed with performances that can serve as guides to rhythms that abound in Cuban music, closes with a Valdés unaccompanied piano performance of “The Clown,” dedicated to Maurice Ravel. In it, he reflects Ravel’s impressionism and something of the French impressionist’s whimsy. You may wish to make note of the names of Valdés’s young Cuban bandmates—bassist Yelsy Heredia, percussionist Yaroldy Abreu Robles and batáist-vocalist Dreiser Durruthy Bombalé. They are all superb. If they record again with Valdés, it will be something to look forward to.